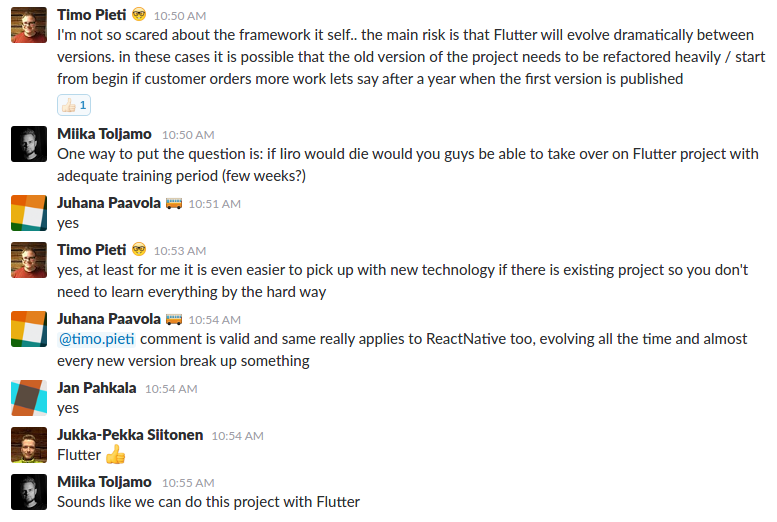 Most people, including me 4 months ago, don’t know what the heck Flutter is. I accidentally stumbled upon Flutter when reading about Google’s Fuchsia. Hearing about Flutter being the native SDK for Fuchsia, I had to take a look. Oh right, yet another one of these frameworks, I thought. As a native mobile developer, I wasn’t really convinced by any of the existing cross-platform frameworks so far. The most promising until now was React Native, which I actually tried on a couple occasions. Having kind of an “I’ve seen this before” feeling, I installed the Flutter SDK. Flutter used Dart on so-called Strong Mode, so I’d be getting the static typing I was used to. There’s nothing to lose at least giving it a try, I thought. 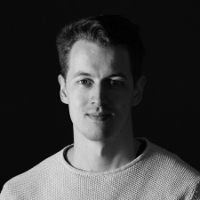 A solid 4 months later, after doing a lot with Flutter, here I am writing you about it. We here at Codemate are generally passionate about new technologies. A day doesn’t go by without someone posting something on our Slack about some new tech. That’s why we have our dedicated Slack channel for that, called #tech-talk. A couple weeks ago, I stumbled upon an article called What’s Revolutionary about Flutter. I thought it was a great article, so I posted the link to our #tech-talk channel. Little did I know what the consequences would be. 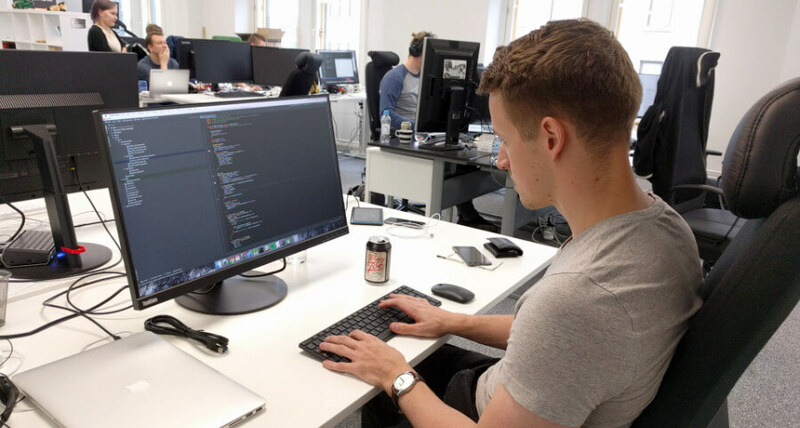 Pertti, one of our software architects, read the whole article through. He was being a little skeptic at this point. Pertti thought Flutter seemed to be almost too good to be true. I told Pertti that I’ve used it for a good 4 months, and it really is a great technology. This spurred some private conversation with him. He had a lot of questions about Flutter and I answered to him as well as I could. After conversing with Pertti for a good 30 minutes, he dropped the bomb. Fast-forward to yesterday, I was presenting my Google Slides to a little short of thirty people, including a handful of our software architects. The first slides are a brief introduction to Flutter. Then they go through a sample app, breaking it into small sections. 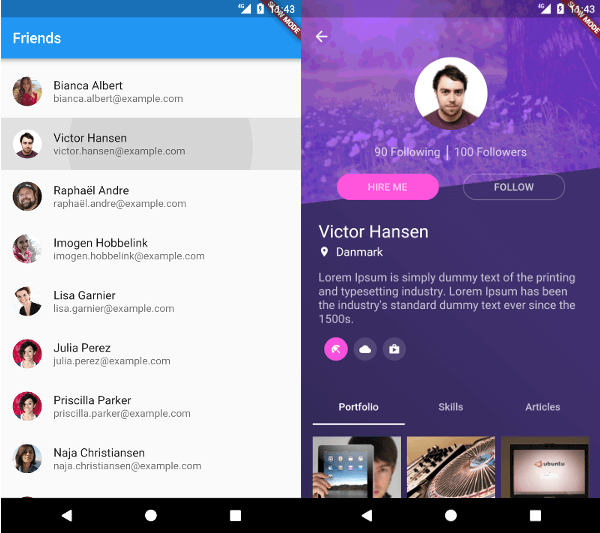 The sample app consists of two screens: one being a list of random profiles loaded from an API, one being a profile details page. All the source code for the sample app is located here. The presentation spurred up some great discussion. Admittedly, I presented some points about the Flutter Widget rendering in a confusing way. For that, I blame my nerves. Our architects, which generally come from a web background, thought the presentation was good. I’m even seeing some interest in Flutter from their end. Juhamatti, or “iiska”, is one of our go-to guys in web development related things. Ask anything web related and he knows. After the presentation, both him and Pertti said that it would be interesting to give Flutter a try. Can we actually use this? At this point I didn’t even care if I got the green light or not. I felt it was such a fair thing to do. So, I went ahead and asked the question on our #mobdev Slack channel. “If Iiro would die…” – that’s the typical Finnish attitude towards life. To weigh the pros and cons in something, we always assume the worst. I was ready to just get a “no” as an answer. I was met with a stamp of approval from almost the whole mobile team instead. In my experience from the last 4 months, Flutter is mature enough for making even complex apps. However, in its current state, it doesn’t fit every use case. For example, if you wish to use Bluetooth or need a full-fledged mobile database like Realm, you’re better off with something else. Unless you like to wait or create native plugins yourself, which you can totally do. If you haven’t, I encourage you to try Flutter. As with any new technology, there’s some learning curve involved. Thankfully the developer experience is pleasant and the documentation is amazing. The Flutter team is being really helpful on their Gitter group, Stack Overflow and GitHub issues. The /r/FlutterDev subreddit has plenty of helpful content coming every week. For the use cases Flutter fits in, it matches and even outperforms its competition. Out of all these cross-platform frameworks, I really believe Flutter could be the One. Hi. I'm Iiro (not Liro) and this is my blog. I'm a Google Developer Expert for Dart & Flutter. I do awesome stuff with Flutter and Dart at Reflectly.